A vegan bistro just opened in my neighbourhood, and as if that’s not reason enough to celebrate and dance with joy, it also offers an all you can eat buffet every day! I absolutely cannot contain my excitement at the opening of Mon Way Bistro. It’s a wonderful addition to West Hampstead’s food scene. We’re not short of vegan options here, with most restaurants on the high street and beyond being quite good at it in general. But a whole restaurant dedicated to vegan food?! On my doorstep?! I’m ecstatic! 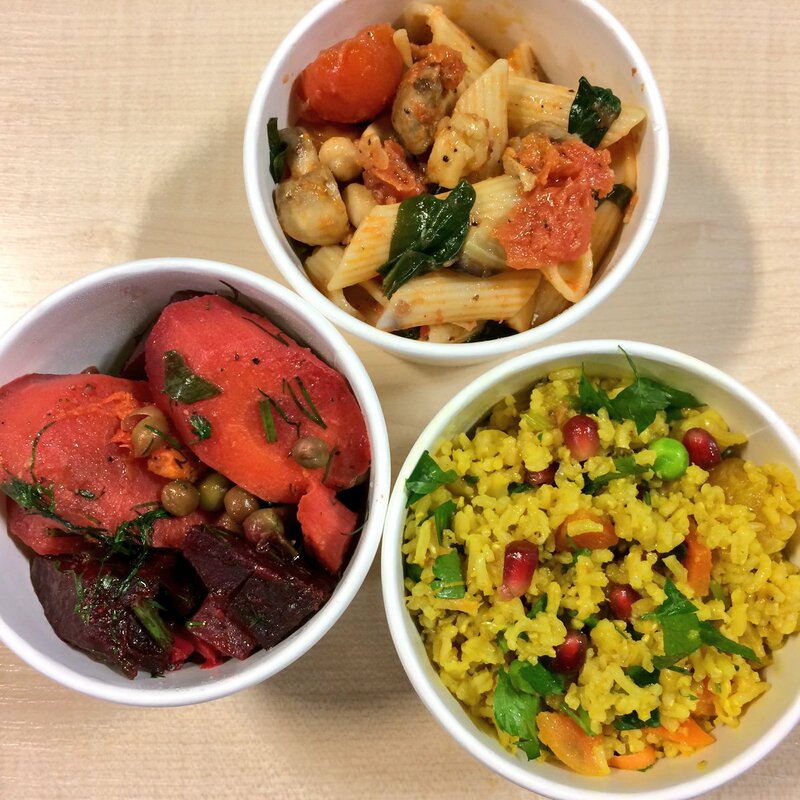 Mon Way serves a wide range of ever-changing hot mains, soups, sides, salads, dips and cake. Yes, even the cake is included in the buffet and you get a choice of several options every day, as well as other sweet treats like vegan truffles and pastries, to name a few. 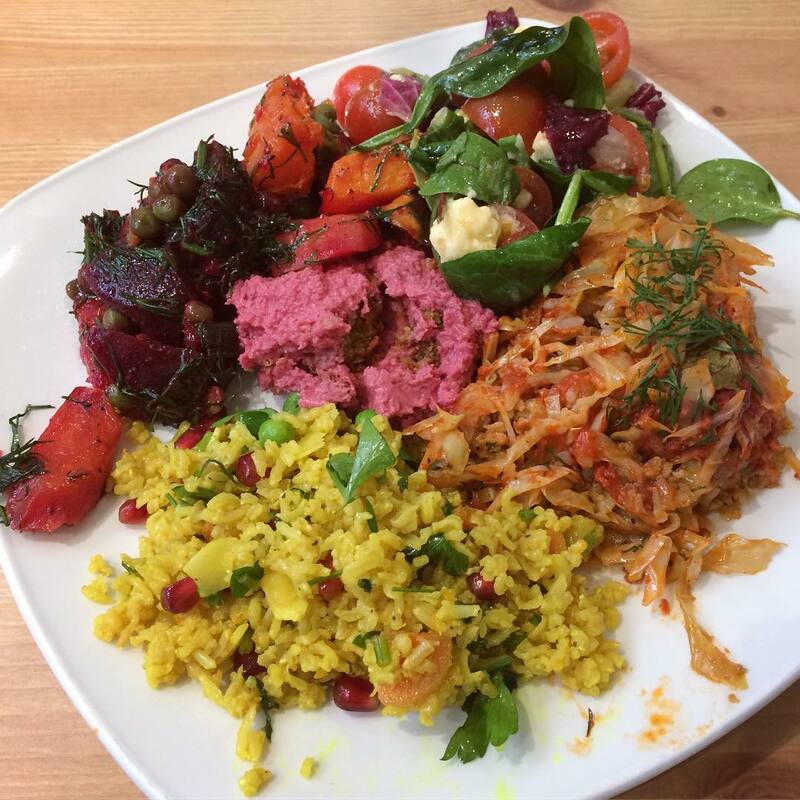 A typical Mon Way buffet plate: Romanian-inspired rice and cabbage main with spiced rice and pomegranate salad, root veggie salad and beetroot dip, and a spinach and baby tomato salad topped with gorgeous vegan feta cheese. Buffets are often themed for the day – Italian, Mexican, Eastern European, Middle Eastern, etc – but also offer a great variety of different dishes for every taste, and a great way of choosing to what level you want to indulge – or keep it healthy. I’m a big fan of their range of salads, especially anything featuring grilled aubergines and smoked chickpeas. The Italian bread and tomato salad is to die for – so simple, yet literally one of the best things I have tasted in my life. As is the butter bean dip, which features some magical secret ingredient (well, caramelised onion) that makes it utterly irresistible. There’s usually a pasta dish to be found, either as a main (glorious veggie lasagna!) or as a salad, and baked or stuffed veggies are another staple. 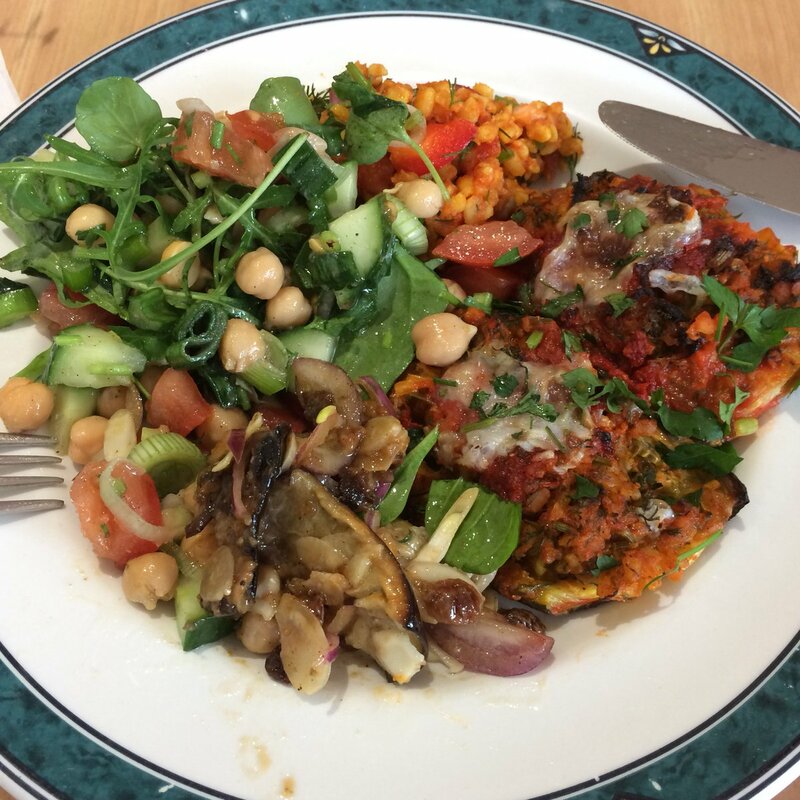 Stuffed baked courgettes with aubergine, bulgur and chickpea salads. Now, for the desserts: we’re talking vegan brownies dripping with fudge sauce, gloriously fluffy apple cake oozing caramel sauce, vegan almond croissants, funky spinach or tomato based cakes with little coconut cream hats, as well as an ever changing range of chocolate truffles and recreations of delights such as Ferrero Rocher and Raffaello. 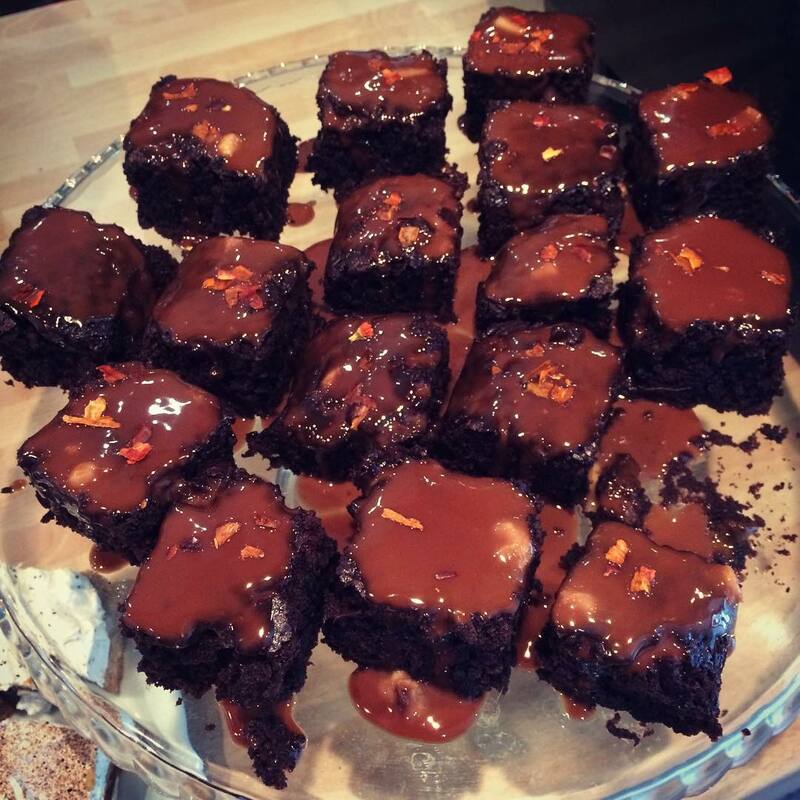 Vegan chocolate and chilli brownies with fudge sauce! Am I biased? Hell yes, I am, because this is my absolute favourite new restaurant and I’m discovering a new favourite vegan food every time I eat there. Plus, the owner and the chef are absolutely lovely, always take great are to cater to any kind of food allergies or preferences, and they clearly love food as much as I do. Whether you’re local to north-west London or not, Mon Way Bistro is a trip worth making. Check out their Twitter @monwaybistro for daily menu updates and Instagram @monwaybistro to feast your eyes. They also do takeaways by the way and they are generously sized, so you get a substantial dinner and a lunch for the next day out of it.